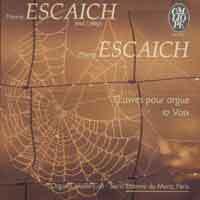 • World premiere: 4/09/1994, final round of the Chartres International Organ Competition. • Commissioned by the Drac-Région Centre for the Chartres International Organ Competition 1994. This is probably the most violent work of this selection of pieces. It recalls the vehemence of certain improvisations. The work leaves the impression of a constant seething, with paroxysmal flashes here and there. In actual fact, apart from a Gregorian chant, forcibly declaimed at the very beginning, the form of the piece consists of a sequence of two great progressions on the theme of the Gregorian hymn Pange lingua, with a short moment of respite in the middle of the piece. The first ascent, based on a rhythmic agent with irregular phrase structures, unfolds in a climate of conflict, in which various planes confront each other; the theme is treated exclusively in a rhythmic fashion. The second progression gradually takes up again the rhythmic agent that has been interrupted in the middle of the piece, but this time in a more regular manner. The result is a long and intense chromatic ascent, based on the low-­pitched ostinato, to which is added a chord theme, again stemming from the Pange lingua. The initial incantatory theme gradually settles in once more during this progression. The piece becomes more and more furious in character, finally reaching a paroxysmal conclusion. Esquisse IV was commissioned for the final round of the Chartres International Organ Competition in 1994.